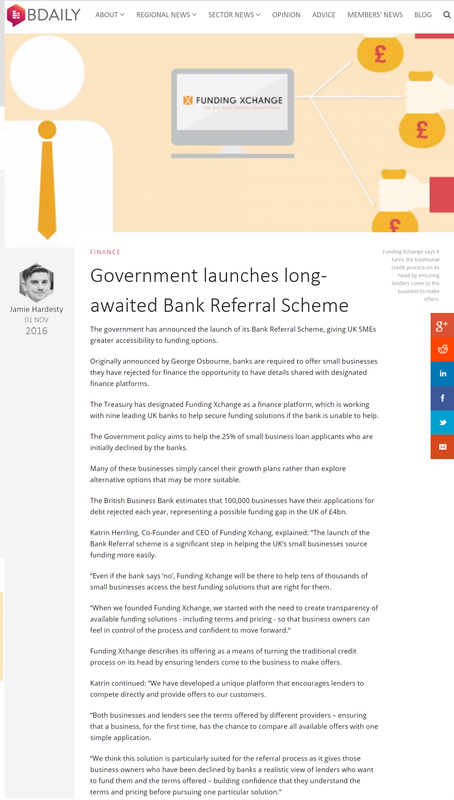 We spoke to Bdaily, the regional business magazine, about the launch of the Bank Referral Scheme and our designation as an official finance platform to help small businesses. Katrin Herrling, Co-Founder and CEO of Funding Xchang, explained: “The launch of the Bank Referral scheme is a significant step in helping the UK’s small businesses source funding more easily. "Even if the bank says 'no', Funding Xchange will be there to help tens of thousands of small businesses access the best funding solutions that are right for them." Click here to read more of what Katrin had to say or see the image below.